THE COTTAGE: This one of a kind private holiday cottage furnished with special things like our European antiques to enjoy a special ambience. Open fireplace, books, CDs, TV/DVDs, complete cooking facilities incl. BBQ, spacious timber deck, a hot bath and ensuite; all these we trust will make your stay unforgettable! HORTICULTURAL: Norala Garden is a BRIGHT OPEN GARDEN icon and was highly recommended on 3AW Big Backyard in 2014. Garden lovers will delight in the splendid renowned garden, established by Norma McGown and Alma Stanhope in the 1960s. Their landscaping story is local lore and the garden is a testament to their love of beautiful European landscaping with extensive English-style dry stone walling and terracing. LOCATION-LOCATION-LOCATION: At 77 Gavan St, you have Bright's center at your doorstep, and can try award-winning restaurants like Simone's (98 Gavan St) or Tanis (100 Gavan St) without having to drive! FLY FISHING: Personally crafted maps with up to date information about fishing hot spots and fly-patterns are provided. A sure-fire way, to catch a local, naturally spawned trout! PEDALLING: A healthy and refreshing way to tour the region. This means you can sample the local wines and the region's best produce in style. HOME GODDESS/KITCHEN KING: Hate having to buy the good oils and spices for dressing your meals on your weekend away? Our kitchen supply of olive oils will complete your gourmet meals, the oils you choose for cooking we leave up to you! LUXURY COMFORTS: You can enjoy the creature comforts of an open fireplace with wood supplied. It will keep the cottage extra warm during those cool High Country nights. 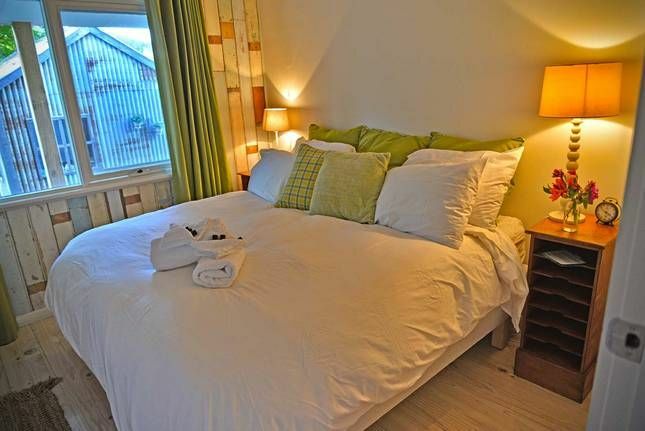 Mrs. Simpson is a newly renovated cottage, and has been furnished with luxury linens from the USA, toiletries from NZ and a mixture of modern and antique European furniture. Mrs. Simpson backs onto the Ovens River and is in the heart of Bright village. - Open plan kitchen with all the modern trappings (oven, microwave, dishwasher and fridge/freezer).Vinegars, fine oils and spices provided to dress up your salad. PRICING and availability is always at the discretion of the owners. Please note as Stayz has substantially increased pricing (by 400%) in recent months, all bookings, originated through Stayz only, will incur a 10% fee to cover Stayz' fees. Upon booking we require a $300 deposit. Complete payment and bond are due 2 weeks before arrival. Cancellation - we fully refund a booking if cancellation is made 2 weeks prior to arrival. Between 2 weeks and arrival we will retain the deposit. Mrs Simpson at Norala Garden is Non Smoking. Unfortunately won't accept families with children under 8, and children have to be supervised by an adult along the creek at all times. This is because Norala Garden has direct and unfenced access to Baker's Gully, which is a seasonal creek that can flow strongly at times, and contains a few deeper pools. We spent a wonderful 4 nights at this property and even though we had pretty much non stop rain for the duration we still managed to enjoy! The cottage had all the amenities for a comfortable stay and the gardens and yard are just amazing. Can just imagine what a spectacle it would be in spring and Autumn. The river and walks just outside of the back gate were a great edition to enhance our stay. We also spent days exploring the surrounding towns of Beechworth and the gourmet region of Milawa. We cannot say enough good things about our wonderful stay at this amazing place! From the minute we stepped through the front door we were enveloped in the warmth and welcoming ambience of this cosy, delightful cottage. Everything was just perfect...from the log fire...the inviting lounges...the beautiful bedrooms....TWO bathrooms....superbly equipped kitchen....the list goes on. Then there was that garden!! What a magnificent creation offering such peace and beauty. Our sincerest thanks to Mike, Mette and Yvonne for sharing this Utopia with us. We WILL be back!!! Thanks both for appreciating this so much! Thankyou Mike and Matte you have added lots of love and attention to the interior to match the exterior Gardens! From the comfy beds to the lovely Bathrooms, laundry and oh my goodness the kitchen. Thankyou for the spices salt and pepper, oils, vinegar to the glad wrap and foil and sharp knives. CONGRATULATIONS and we will be back again. Wood fire to heat the Cottage just perfect! Thank you both, our pleasure! Fantastic property, we loved it. The property is perfect. Gorgeous cottage with everything you could hope for. Lovely kitchen, good bathrooms, new laundry facilities, comfortable beds. The location was excellent with direct access to bike paths and the river. The setting was secluded and private in a magical garden. Thx for your review, we are thrilled people appreciate the package of beauty, comfort and seclusion in the middle of town.